As I sifted through the LPs in the Music Library’s vinyl collection, I was particularly drawn to a section on big bands. 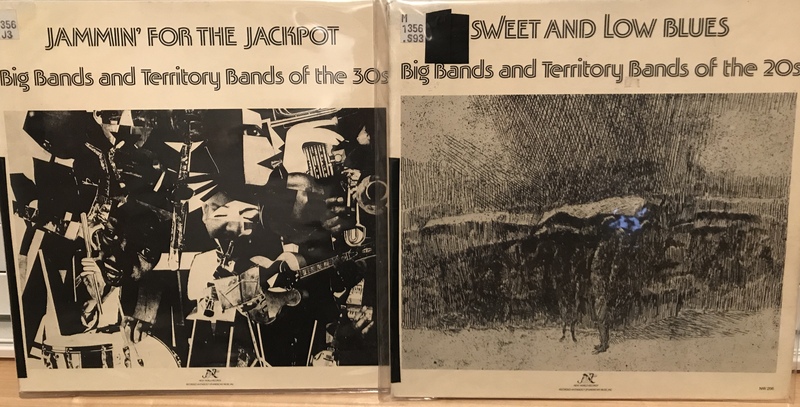 The two LPs that piqued my interest the most did not catch my eye because of their cover art, but rather their titles; “SWEET AND LOW BLUES: Big Bands and Territory Bands of the 20s,” and “JAMMIN’ FOR THE JACKPOT: Big Bands and Territory Bands of the 30s.” My first thoughts upon seeing these records were: 1. I know a little about big bands, right? and 2. What is a territory band? 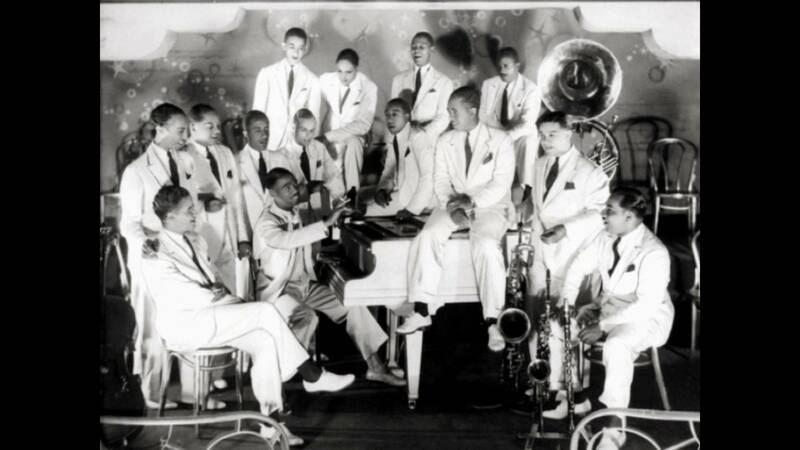 Here is a digitized recording of “Madhouse” performed by Earl Hines and His Orchestra — one of the tracks found on “JAMMIN’ FOR THE JACKPOT: Big Bands and Territory Bands of the 30s,” so you can hear the style of music I am referencing. By the time the Great Depression hit in the 30s the territory bands were failing to survive, as live music was replaced with the radio, and having a disposable income was no longer an option. While all of this was going on, back at St. Olaf a mysterious “L” was expressing their own opinion on jazz music and dancing in the Manitou Messenger. “L” calls the jazz band “contemptible,” “obnoxious,” and “profanity in music.” The author argues that the jazz band and jazz music do not correspond with the (Christian) spirit of St. Olaf College, and should thus be driven off the hill. “L” does, however, recognize that jazz music naturally calls us to dance. They even pose the question “Why allow temptations such as this to exist?” if we know it’ll just make us want to get up and start dancing. Remember, dancing was forbidden at St. Olaf during this time. When you search the Manitou Messenger archives for “dancing” during this period it is consistently referred to as “folk-dancing” or “traditional-dancing” or “Norwegian-dancing” – safe forms of dancing that correspond with the mission of the college. So, there’s quite a contrast between the popularity of ballroom dancing accompanied by touring territory bands in the 20s and 30s, and the nasty portrayal of jazz music and dancing by a student from St. Olaf. All I can do is wonder what “L” would think about our jazz bands and swing club. Another example of taboo dancing in the Manitou Messenger. Taken from “Growing Pains,” published in 1935. “Territory Bands.” Encyclopedia of Popular Music, 4th ed.. Oxford Music Online. Oxford University Press, accessed October 31, 2017, http://www.oxfordmusiconline.com/subscriber/article/epm/49928. Bradford Robinson. “Territory band.” The New Grove Dictionary of Jazz, 2nd ed.. Grove Music Online. Oxford Music Online. Oxford University Press, accessed October 31, 2017, http://www.oxfordmusiconline.com/subscriber/article/grove/music/J445200. Marc Rice. “Territory band.” Grove Music Online. Oxford Music Online. Oxford University Press, accessed October 31, 2017, http://www.oxfordmusiconline.com/subscriber/article/grove/music/A2276655. Taylor, J.R. Jammin’ for the Jackpot: Big Bands and Territory Bands of the 30s.